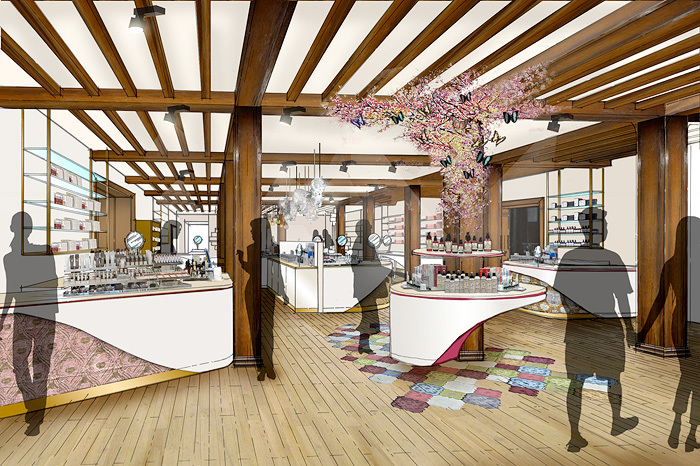 Changes are afoot in the iconic shopping destination that is Liberty of London, the beauty hall has undergone a huge revamp and now boasts double the floorspace! This will hopefully mark the end of shoe-horning my frame into impossible angles whilst trying to take a peek at the latest OPI & Essie shades. I hate that little polish alcove with a passion. An additional benefit to having all that extra space means more brands, perhaps most noteworthy is the introduction of U.S. brand Hourglass Cosmetics (Modesty Brown has some pics of the counter here) to the store’s portfolio! Long-lusted after and previously available only online in the UK, it will be a treat to letch muse over the counter and have a close-up look! Other new introductions to the beauty hall include Trish McEvoy, Bobbi Brown, Chantecaille, Dermalogica, Colbert MD, Decleor, Aromatherapy Associates and Sachajuan (phew!). The store will also be expanding its rather fragrant ranges from Maison Francis Kurkdjian, Byredo and Malin + Goetz. Have you checked out the newly renovated space at Liberty yet? Enabler! Will do so this weekend! Sadly I don’t get to go to London too often, but I’m planning on a trip in August, so will check out Liberty then. AHHHH Hourglass!! Can’t wait to check it out next weekend when I get to London (from Hong Kong)! I have been along. I went in yesterday and was surprised by the expanded area. I almost had a heart attack when I spotted Hourglass! I’ve posted up some pictures of the new counter today. Feel free to re-post any of the pictures (I know it’s probably sad to take pics of a counter but it’s like makeup p0rn!). Oooh. Love me some Bobbi. Do! I spent an amazing amount of time in the new perfume bit… just tdf!